In this final part, we have a quick look at what is still left to do for local radio to match FM coverage. As we saw from part one, radio started out as a regional services. From this national networks were added. Then from 1969 onwards, local radio was added. However, running a network of local radio stations, all with their own output, staff, presenter and news has always stretched the budget of individual stations a little bit thin. This is as true for BBC stations, which share a small proportion, 4.6% of the TV Licence (£114.7m on content, £9.9m on distribution, £27.9 on infrastructure, making £152.5m), as it is for local commercial stations that fund themselves from adverts. 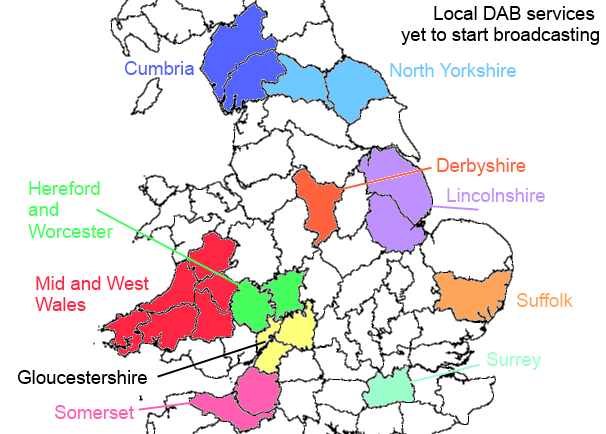 Almost all of the country does now have a local radio DAB service - see List of all DAB multiplexes, but there are still some on the "to do very soon" list. The "missing" services cover 5,583,000 people, which is about 9% of the UK population. Why can't we have local radio on Freeview? The Freeview service is provided on six Multiplexes. Like the DAB multiplexes, these services provide a large number of channels together on a single broadcast. The three "commercial" multiplexes operate a UK wide service, and are therefore unsuitable for local radio. One of the "public service" multiplexes is for high definition TV services only. This leaves the BBC and Digital 3+4 multiplexes. However, even though these services are "regional", they each cover many "local radio" areas. It would therefore be impracticable to add so many local stations to either multiplex. However, Local television on Freeview is coming. These services are designed to provide a local TV service to specific local areas. It may be possible for each of these multiplexes to have local radio added to them. Why can't we have BBC local radio on Freesat or Sky? 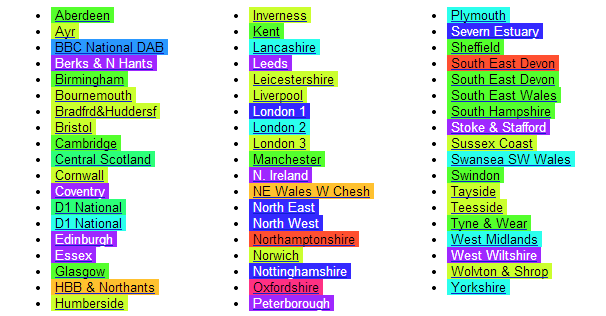 The additional cost for the BBC to add the 39 local radio stations not on digital satellite (BC London 94.9 is already there) to the four DVB-S mode transponders would probably be marginal. However, the BBC does have to currently pay Sky a large fee to add channels to the Sky EPG, so this would be perhaps unreasonably expensive (see Government to stop Sky charging public service broadcasters for "retransmission"). And whist the BBC owns Freesat, it would probably not be worth the bother of up linking 39 radio streams if Sky viewers could not also benefit. Why is is that although we have DAB great swarthes of the country fail to get service. Travelling from lands end to london, most dab services are patchy. If you take Gold in particular we cannot get it reliably in Penzance. the service in the car is somewhat better but that becomes patchy from Launceston and existent from Exeter to London along the motorway corridor. Surely with technology today we should be able to provide a reliable service. Alan Francis: Have you tried other stations? Gold is only available on a few local multiplexes, it does not have national coverage. I find it hard to listen to DAB radio... somehow it tires the ear and often sounds as though it is coming through water... listening to music on DAB is a definite no go. Such a shame that yet another format [analogue] may be ditched for poorer quality DAB. FM sound quality is vastly superior. The BBC have recently said that they will not phase our FM just yet. 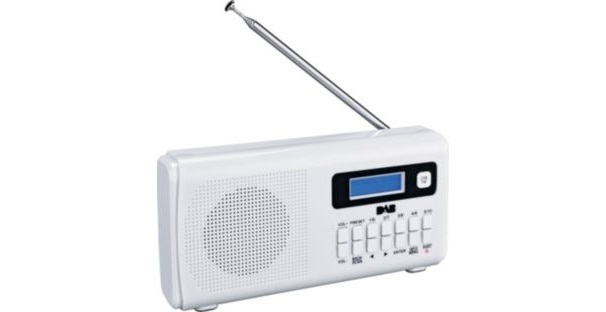 They have realised that there are problems with DAB reception and that people are not that keen on the sound of digitised music and the lack of stereo. So we wait to hear what they actually plan.